Spartanburg School District 7 encompasses the heart of downtown Spartanburg. 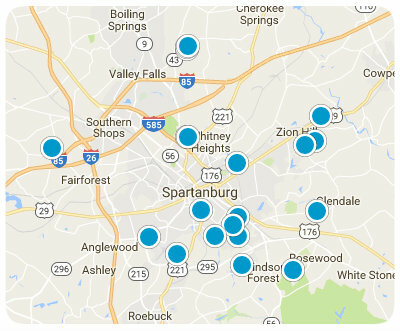 Seeing an increase in growth due to the growing healthcare systems located here and attractiveness as a magnet for many corporate headquarters, the city of Spartanburg offers a wide variety of opportunities for employment, leisure, and housing. Located at the center of downtown Spartanburg, District 7 offers all of the amenities and entertainment of a downtown scene without the hustle and bustle. Barnet Park is a premier entertainment venue in downtown Spartanburg and brings in concerts and events throughout the year providing fun for the entire family. The downtown scene in Spartanburg is continuing to grow everyday and shows no signs of stopping anytime soon. So whether its browsing downtown Spartanburg’s fantastic boutiques, having a meal at one of the many fine dining restaurants, or playing a free round of miniature golf at Sparkle City Mini Putt, you can be sure that there will always be family-friendly fun right around the corner. Spartanburg County School District 7 has a history of award winning educational excellence and is only poised for more growth and success. With the recent endorsement of a $185M bond measure, the district’s future in education is looking bright, as it is now positioned to fulfill ongoing projects that will bring significant advances in the years to come. The already award winning Spartanburg High School, which is the first school in the nation to win the prestigious Blue Ribbon School Award four times, is set to be rebuilt by 2019. The new high school will be equipped with state-of-the-art technology, larger classrooms, and all new facilities to support performances and athletic events. Along with the new high school, District 7 is also set to build a new state-of-the-art elementary school to replace Houston and Chapman Elementary schools, estimated to be open by the Fall of 2018. The future is promising for Spartanburg County School District 7 and is more than capable of fitting all of your child’s educational needs and aspirations. Due to its proximity to downtown Spartanburg, real estate in District 7 is a hot commodity. Real estate in District 7 has much of a colonial feel, with old brick southern style plantation homes. Even current Carolina Panther superstar Cam Newton has found his summer camp home in beautiful District 7. Cleared and level lot near Cleveland Academy and the Northside Initiative. All public utilities available. Residential lot in Hampton Heights. Acreage is approximate. Level Residential Lot. Acreage is approximate.